GIS Map provides map-based access to data items such as wells, seismic surveys and lines, cultural data, and any other information that can be represented on a map. GIS Map allows the User to select data items and view relevant reports and applications, including the ability to export data to other formats such as Word, Excel, and xml. Western Australian Petroleum and Geothermal Information Management System (WAPIMS) is a petroleum exploration database containing data on titles, wells, geophysical surveys and other related exploration and production data. The system also contains the Core Library (Perth and Kalgoorlie) database. 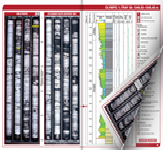 Open file well sample analysis data extracted from reports submitted to DMIRS under Petroleum Acts. Western Australian Petroleum and Geothermal Information Management System (WAPIMS) is a petroleum exploration database containing data on wells, geophysical surveys, titles and other related exploration and production data. The system also contains the Perth Core Library database. WAPIMS contains released data and all public information arising out of petroleum exploration activities within Western Australia’s State jurisdiction (onshore and State territorial waters) together with Commonwealth offshore activities released prior to 1 January 2012. For information on petroleum exploration activities in Australian Commonwealth waters off Western Australia (outside State territorial waters) released after 1 January 2012, please contact Geoscience Australia at ausgeodata@ga.gov.au or the National Offshore Petroleum Titles Administrator (NOPTA) at http://www.nopta.gov.au/. 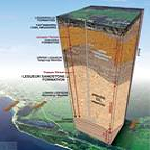 The Department of Mines, Industry Regulation and Safety, in collaboration with NOPTA (http://www.nopta.gov.au/about/index.html ) and Geoscience Australia (http://www.ga.gov.au/), has established the National Offshore Petroleum Data and Core Repository (NOPDCR) through which petroleum mining samples are archived, maintained and made available for use once the relevant confidentiality periods expire and data is authorized for release. The Perth Core Library is now the storage and sampling location for the 2/3 core and one set of cuttings for all offshore jurisdictions around Australia together with the Western Australian State petroleum samples. They are now available for viewing and sampling by industry and a complete list is available in WAPIMS (Search toolbar). Easier to use search interface - find data quicker and easier than ever before. Core Library data is now available. WAPIMS is now compatible across all 5 major browsers (IE 9+, Chrome, Firefox, Safari and Edge). HTML 5 Map Search means the map can be now viewed on all platforms including a tablet. New Request Forms allow you to request Core/Cuttings and Sampling via the website. Detailed information regarding the release of State petroleum data can be found in Part 9 of the Petroleum and Geothermal Energy Resources (Resource Management and Administration) regulations 2015. Open information (also known as 'always open' information) about a well or survey including the name, location, type or purpose, and other general information relating to the activity being undertaken. DMIRS may make 'open information' about a well or survey publicly known at any time. The earliest release date for the well's basic data and reports is two years from the end of the activity. Where permits expire through surrender, cancellation, revocation or termination the data becomes releasable on the day of expiry. Release provisions for basic survey's data can vary according to survey type, permit type, and commercial intent (exclusivity). The earliest release is three years from the end of the activity. Confidentiality periods of up to 15 years may apply. Please direct questions regarding the release provisions to petdata@dmirs.wa.gov.au. Due to website file size restrictions some large documents and data-sets cannot be uploaded to WAPIMS. Please download the ‘READ ME’ file attached to these entries and follow the instructions. Where data is not available digitally, you may order a copy of the original tapes or cartridges through WAPIMS by adding them to your order basket. The customer is responsible for all costs associated with the copying or transcription of tapes and cartridges. To start browsing, use the Search Bar above. Should you have any queries or questions, please contact us contact us. Petroleum data packages are available on request. These contain all open file digital information from wells and geophysical surveys acquired for petroleum titles in onshore Western Australian and the State's territorial seas. Delivery is by a new portable hard drive provided by the customer. Contact us to request a data package. The Geological Survey of Western Australia (GSWA) in collaboration with NOPTA (http://www.nopta.gov.au/about/index.html) and Geoscience Australia (http://www.ga.gov.au/) has established the National Offshore Petroleum Data and Core Repository (NOPDCR). The offshore petroleum mining samples previously located at other state or NT repositories have been consolidated and relocated to Canberra and Perth. Petroleum mining samples from both Commonwealth and State wells are archived and maintained at the Perth Core Library. These are made available for use once the relevant confidentiality periods expire and data are authorized for release. To browse Commonwealth and State wells that have petroleum mining samples available for viewing and sampling, please use the Core Library tab. To access reports of previous studies completed on the cores, use the Search bar. GSWA aims to preserve the integrity of the core and cuttings stored at the Perth Core Library, while allowing access for further research to advance the understanding of petroleum prospective within WA and Australia. For this reason, please be aware that approval to sample will not be granted for state well samples where similar analysis has previously been conducted or where only ¼ core or 50g cuttings remain. It is recommended that you review this information, available on WAPIMS, prior to submitting a request to collect samples. Permission will be given only after an examination of current holdings within the Core Library/ Core Repository by respective staff and the supply of a comprehensive list of material to be removed for analysis. Approval is subject to the volumes of material available and a review of the results obtained from previous destructive analyses. When sampling core for destructive analysis, the minimum sample amount required to achieve the analysis should be taken, and it is expected that the sample will be consumed in the analysis. Core sampling will be limited to a 1/4 core section by volume and a representative 1/4 core section will be retained for archiving purposes. If the core is not destroyed, contaminated or consumed in analysis it is to be returned to the core facility of origin within 6 months of the sampling date. When sampling cuttings for destructive analysis, the minimum sample amount required to achieve the analysis should be taken, and it is expected that the sample will be consumed in the analysis. Cuttings sampling will be limited to 10g per interval and 50g will be retained for archiving purposes. Samples from cuttings must be representative of the total sample (selective sampling of chips from a particular lithology is not permitted). If the cuttings are not destroyed, contaminated or consumed in analysis it is to be returned to the core facility of origin within 6 months of the sampling date. A detailed digital inventory of all samples/volumes taken from each well and the purpose for which they were taken is to be supplied at the completion of the sampling. Where analyses are conducted on samples from WA State wells, a copy of the report containing all basic data and interpretations of the results must be submitted to the WA " + Department of Mines, Industry Regulation and Safety + " on digital media to the Manager or alternatively via email (10Mb limit) to petdata@dmirs.wa.gov.au within 6 months of the sampling date. Where analyses are conducted on samples from Commonwealth wells, a copy of the report containing all basic data and interpretations of the results must be submitted to the NOPDCR on digital media to the Manager or alternatively via email (15Mb limit) to ausgeosamples@ga.gov.au within 6 months of the sampling date. All prepared slides (palynology / thin sections etc.) from both WA State and Commonwealth wells are to be submitted to the WA " + Department of Mines, Industry Regulation and Safety + " within 6 months of the sampling date. The Paleontology Relinquishment Collection consists of petroleum mining samples from wells drilled in both WA State and Australian Commonwealth areas. To browse slides and residues available for loan, please use the Search Bar above, and select Wells. Loans are initially for a period of 6 months unless other terms are agreed to. This loan period may be extended upon application. The department reserves the right to recall any material at short notice. A report containing both basic and interpretative results of any examination of paleontological and petrological material should be submitted and all loan materials returned to the department by the end of the agreed loan period. The report is to be submitted in PDF format and clearly state the Approval number. The report will be released as open-file 6 months after the material is made available. Holotypes and paratypes of any new species described from the material are to be reposited with the department. In the case of residues and undigested sidewall cores, any slides or other preparations made from this material, as well as unused residue and sidewall core, are to be returned to the department. Click here to request slides or residues.